Questions often unanswered; but with imagination.. they might be. When the person is being coached, they know the questions are important and they do find answers. They are already committed to finding their way to live life more fully. When this happens in a non-coaching conversation, those same questions usually won’t get an answer – except sometimes if I add, ‘Imagine you’ll win a million dollars just for finding those answers.” More often than not, though, that just elicits thoughts that lead only to dreaming of a lottery win that will save them. Why won’t people generally take a moment to find those answers? Because they are already blocked from thinking of those possibilities by their realistic vision of what their life looks like. Apparently reality really does bite if it stops people from living more fully. If you aren’t finding answers, think small. Small. Small. Small. – Tiny things you can let go of. – Tiny energy giving things you can fit in. Keep in mind that tiny actions are the ones more likely to be acted upon right away, anyway. Promises to ‘do lots’ weigh heavy. So, whether you found small things, or big things, I invite you to break them down into ridiculously small first steps and take that step. It’ll feel good, honest. Posted in Empowering you, me.. and tagged imaginaton as a coaching tool, powerful coaching questions, powerful questions, Question Answering. Bookmark the permalink. The Treasure Trove of Gifts from the Amazing Fundraiser! This note began the night of the Sept 1 fundraiser… and finished today! A new warm cap and a “How to Speak Pirate” book sit on the arm of the chair. “Kissing the Witch”- A collection of Irish faerie tales is whispering, “curl up with me.” I will light the mandarin candle, glance once more at the moon, and snuggle with the gifts beside me, and the gifts this day has shared. 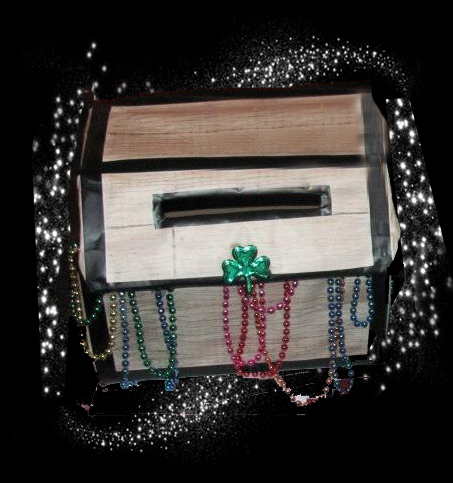 There’s a very fine pirate’s treasure chest in my home.. it was made by precious kids especially for today’s event. As I write, I’m tucking the trove of thoughts into it. The words may not all get written… but the feeling of this magical experience will not go astray. I imagine as I write, the gifts of this day will overflow beyond the page, beyond the chest, beyond.. well, beyond imaginings… just like the bootie of colourful beads that spill outside the hand made treasure chest. Diamond Dust: If you’ve never seen joy bouncing off people -hitting the ceiling, the walls, the floors, each other- it looks like this event. Glow of Gold: If you’ve ever felt you were lifted a bit beyond the norm, beyond the usual physical setting, beyond the usual separation we think exists between each other, then you’d understand what I felt like at this event. Strings of Amethyst Beads: Feeling the energy of joy, play, love, caring, community, compassion, and generosity took me to that altered state, where seeing the energy became easy. Ruby Magic: Beyond a doubt, the collective of artworks and inspired offerings added bucket loads to the alteration from ‘norm’ to ‘magic’. This is always true of a place filled with creativity, but perhaps even more so given they arrived there in such a spirit of caring. Coal: The day didn’t start like that. I woke up nervous… I was going to experience something I’ve never experienced. Normally, that’s very cool for me… but an adventure travelling, or a new sport, or a new art medium, or a new workshop, or a new client… it’s not completely foreign. There’s always the one before that had similarities one can relate to. But really, when had I ever shown up somewhere vulnerable, healing from a serious illness, an income that’s crashed, admitting all this so publicly, and there to accept the much needed support of so many? Fortunately several months of dealing with this had already led to me practicing the art of accepting help. The phrase “It takes a community to raise a Janet” came to mind on a weekend when my family looked after my house and yard, people had been bringing me food for two months, and I looked at all of the help knowing that I absolutely needed it. It’s humbling. And I never would have guessed how good it is for our soul to accept that extent of help. So, there was that… that gave me some golden coins in the foundation to be able to walk into this event. Essence of Emeralds: Well, sheesh.. I didn’t need to worry. That energy I described earlier? I could feel my energy lift the moment I walked in. The room was filled with laughter and excitement and people greeting each other and ‘oo’s and ah’s’ as they explored the donated artworks and services and gifts. I think that if I’d been having a day where my only option would have been to show up and lay on the couch, I would have done it. I was pretty tuckered, but I knew that I couldn’t miss the event… the muses who pulled it together always always lift my spirits, long before I began this healing adventure. The awe I hold for all who donated… I wanted to honour that. And an event where people got to share their inspired works and services, and in doing so, inspire others? Heck, I couldn’t miss that. And I wanted to be there to show my gratitude. Extreme, overflowing, full of love ruby sprinkled gratitude. I could not have guessed how healing this event would be. I know now how much I healed just being there. The treasure glow continues: My spirits remain lifted. Yes, this little ‘Apres the Fundraiser’ note is over two weeks in preparation to share. Because it could be a book. I have sooo much I’m inspired to say! But like so many things I start, I don’t necessarily get finished. It’s the way my body, mind and soul is playing these days. But I do want to at least say what I’m sharing now. I stressed over thank you cards.. all the thank yous that go back to last spring and continue now. My daughter said, “Mom, I don’t think there’s anyone who expects you to get to thank you cards right now.” I hope it’s true. Please know there are some creative cards in the works.. and even that is a gift to me with their opportunity to creatively thank you. As inspired as some think I am, it comes down to this: This was a crash. I looked at myself from the eyes of a coach and said, “Knowing what you know about this woman and what’s been going on in her life, what questions would you ask her to help her get through this?” The answers came back: There is no energy left for anything that drains energy. Put all of your energy into what lift your spirits, tiny do-able things each day. So there are practical things that don’t get done. Plans that don’t get made. But the method of ‘doing what feels good’ and being gentle to myself in thoughts and actions, is working. I admit that’s not the easiest thing in the world, but I’m inspired to stay true to it. And honestly, it’s because of all of you .. the muses and my clients and honouring the work /play you’ve done, by taking the techniques and making them work to the extreme when I most need too. And what felt good this week of feeling rather crappy? It was basking in the rememberings of the fundraiser. Each day, honestly, my spirits were lifted basking in that. Sapphires, Opals, Gold, Amber, Strings and Strings of Wildly Wondrous Things: All the people who donated items! All the people who came to the event! All the people who purchased! All the people who sent wishes! All the people who organized and made it so beautiful! The amazing facility! I’ve never seen such an entertaining silent auction with people bantering to win their bid, sneaking in quietly behind the most recent bidder hoping they weren’t noticed, whispering funny stories to me about how they are going to win their bid, along with kind heartfelt messages, offers to help, warm hugs, uplifting stories and so much love. And all this: Jaunty, Jubilant. Fun. Fantastical Family Jewels: In the morning, when I was wondering how to ‘be’ at the event, I imagined different people I know.. confident outgoing people, and pictured how they might respond. Then I went through my family one by one and I laughed out loud. Not one of us could I imagine comfortable in the spotlight, especially this kind of spotlight. It may surprise you, but I have always adored being behind the scenes, watching others take the spotlight and celebrate their successes. By nature, the spotlight isn’t really my family’s thing, nor my thing. Okay, not true of Evalee and Lainey, social and outgoing those two! How fun is that. And guess who I grabbed onto to give me strength at the event? But the rest of the family… you’d never have guessed that they are less comfortable in a setting like this, if you were at the event! And I want to thank each and every one of you who supported this event in any way at all.. even in thought, because what I got to witness with my family is forever memorable. This is not an easy journey for my family. I tend to think it’s harder for those looking in, than for me. I’ve been the person looking in. It’s hard. And here they were at the fundraiser; Laughing, smiling, loving the competition to win their bids, chatting and hugging people, having a glorious time. I sat a lot and I watched and I loved seeing that diamond dust glittering around each of them. Blessed. Thank you, everyone, for making that happen. The next day my brother commented on how amazing it was: An event based on such a difficult situation and there wasn’t any air of sadness.. it was pure celebration. That’s the muses for you.. they set that tone. This is the part I could write tons about how it is they are like that, but for now: Wow. John also laughed about how nice it was that it simply wasn’t the type of event where the key question of the night is ‘So what do you do for a living?” Ha. How true. Authentic people, authentic celebration, authentic community, authentic sharing the love. My. My. There are so many people to thank. Thank you. You’ll hear from me personally. But for now, muses, all who donated, family, friends, and people I’ve never even met – thank you, thank you, many tall ships full of treasures chests of gratitude. May you all have Glow of Gold moments: As if you are lifted a bit beyond the norm, beyond the usual physical setting, beyond the usual separation we think exists between each other, and you can see and feel the amazing diamond dust energies that can join us in wonder, delight and love. Holy Moly, I finished this on kemo day… I may shake my head tomorrow, but I do think this is a tribute to the event and how the wonder of it is getting me through kemo day and even able to write! Okay, perhaps a little overdone on the jewel theme.. but heck, it feels right. (Oh my! I just went to post this on the facebook page and I see the auction items that are now available online! Oh do look at these great items! http://healingjanet.wordpress.com/2012/09/16/online-auction-the-fun-continues/ Inspired people, inspired works. Posted in Healthy Me - a Healing Adventure and tagged community spirit, Janet Whitehead healing fundraiser, Man I love you all., supporting a friend healing from cancer. Bookmark the permalink.